Each children’s book by Jerry Spinelli surprises me with both the content and the execution. The writing is good, the content sensitive and important. However, the books I’ve read have been for older readers (Jake and Lilly, and Stargirl.) It’s a delight to see the author reaching younger readers as well. 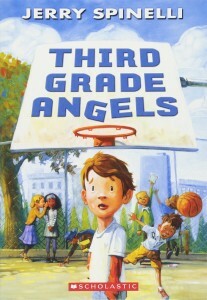 This is a lovely read, perfect in every way for third graders. Its humor and a bit of pathos will resonate with those kids who try to hard. The hero’s self-reflection is perhaps a bit of adult intervention, but it makes the story work. I don’t know too many third grade kids who recognize that they are only happy if they are first! Even if it’s true, it takes a while for that to sink in, like maybe forty or fifty years :). I enjoyed the way the author created a drama based on an inner conflict, and offered very sympathetic adults to help our young ‘angel’ find his way. Of equal importance is the not-so-subtle lesson that being kind and caring is part of living, and not something that we do only when others are looking. There could be no more valuable lesson for children than this, and hopeful it is reinforced in schools and homes everywhere. As a way to bring more kindness to a challenging world, this children’s book can make a difference.